Franklin Basketball was first established in 2009 (Incorporated 2012) when Jamie Reddish and Trent Iulirealised that there was huge gap in the basketball opportunities provided in the Franklin district. At the time there were no basketball programs or clubs being run and those who wished to play basketball had to seek programs based more than an hours drive away. They first established a program where players were taught the fundamental basketball skills (now called Hoopsters), as the numbers grew they were able to begin running a league and provide opportunities to play regular games (now called Teamsters). 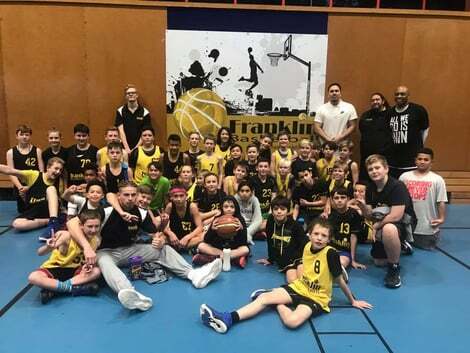 Since the establishment of the Teamsters league, Franklin Basketball has experienced exponential growth which has lead to programs based out of both Pukekohe and Waiuku. Primary/Intermediate player numbers in 2017 reached over 250 players alone, the Secondary Schools league which has reached its capacity the last two years had 33 teams entered during Terms 2 & 3. Franklin Basketball is still lead by Jamie Reddish in the position of General Manager along with other part-time coaches and admin staff. Our club committee supports Jamie in the day to day running of the club by ensuring medial tasks are taken care of so that the future direction of the club is his priority. Amongst our team of coaches there is both a lot of playing and coaching experience. Our coaches are always trying to up skill by attending coach development opportunites and tours to increase their knowledge and become better for the players within our club.